Most days, when I look into Jax’s bright blue eyes, I feel like our family is complete. Some days, when I watch him gaze out the window searching for new friends, I’m sad that he doesn’t have a little brother or sister to keep him company. Jax is thinking: But I want to go sledding with a sibling – not my mom and dad! Two kids: that’s always been our plan. And all things aside, there was never really a question of having another. Jax wasn’t supposed to be an only child. But, throw in the difficulty we had getting pregnant and the intense fear and reality of having another NICU baby, well – that makes the decision a bit more difficult. We’ve been paralyzed with this decision. Stuck. Unable to move forward in any sense of the word. Unable to think about it, talk about it, decide. Unable to move past our fear and our experience. There are so many factors affecting our decision. We aren’t spring chickens any more. Do we want to be the “old parents” at the school drop-off? Are we already? I am a carrier for two rare genetic mutations that cause Cystic Fibrosis. There is a chance our baby could have CF or be a carrier of the mutations (which could affect future grandchildren, etc). We don’t know the cause of Jax’s early arrival (and neither do the doctors). What if it happens again? We have a toddler. There is a very high chance that a future pregnancy would require bedrest, hospitalization, or an early delivery. 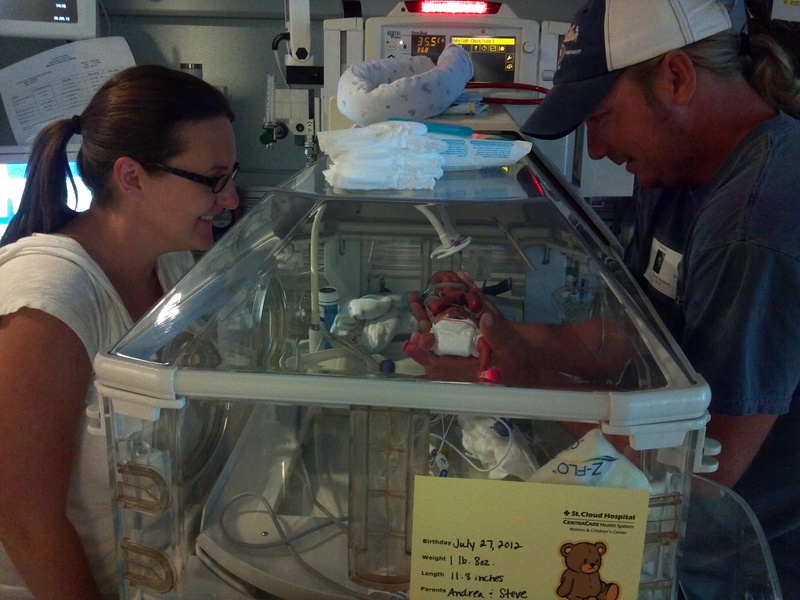 How would we juggle taking care of Jax and a NICU baby? We needed help sorting through all of these things. Yesterday, we had a preconception consultation with a Maternal-Fetal Medicine (MFM) doctor and a genetic counselor at the University of Minnesota who specialize in high-risk pregnancy. It was the first step in moving forward with a decision to have another child or not. It was also a chance for us to get some closure on what happened with Jax. I’m so glad we did this! The consultation gave us… HOPE! There is a 50% chance that I would have another premature baby. There are two interventions that would help reduce the chance of preterm delivery to 30%: P17 injections (progesterone) and a cerclage. There is a high likelihood that I would be on bedrest for a part of my pregnancy. These interventions would make it very unlikely that I would have another micropreemie. I would be seen by the OB weekly once I hit 16 weeks. I would not have to see a special high-risk pregnancy doctor! This was the most surprising outcome. I thought for sure I would have to see a specialist throughout the pregnancy. Instead, I would be able to see my regular OB for check-ups, as long as things are going ok. If it I need the cerclage, I would be referred to the MFM doctor to do that surgery. I will be checked for uterine abnormalities prior to conception. The doctor will inflate my uterus with saline and check for anything suspicious. Apparently, there is a chance that my uterus just won’t expand enough to carry a full-term baby. This could be a reason Jax came early – there just wasn’t enough room for him! The results of this test will bring us one step closer to a decision. The doctor left us with these words “You could deliver a healthy 8lb baby after being induced at 41 weeks.” Wow. Now – we have some thinking to do! Will we be able to handle the stress and worry of a second pregnancy? Will we be ok with the fact that there is a high chance of having another NICU baby? Is one child enough? We don’t know yet. But it feels good to have some hope. Did you have a baby after a preterm birth? What was it like for you? How did you cope with the worry and stress? Was your second child full-term? If not, how did you juggle having a child at home and one in the NICU? Any words of advice for us?